St Anne’s Cathedral, or Belfast Cathedral, is a beautiful church in the very centre of Belfast. It is open Monday to Friday from 8am to 4pm. In the weekends the church is closed, except from the daily services which are held. The church was completed in 1904. 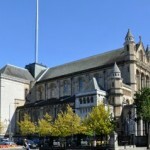 The building is a Romanesque building where tourists, pilgrims and regular worshippers come together in the centre of Belfast. Belfast Cathedral is an ideal place to drop by as you walk from the city centre towards the Odyssey Arena or maybe the Titanic Museum, or if you want to relax after some serious shopping in Castlecourt.